Kris' Custom Sewing is well known for making boat covers. All of our boat covers a fully custom, designed to fit your boat. Unlike other boat covers that make your boat fit the cover, these covers are custom made to your own boat with materials that will last for many years to come. Whether you are restoring an older boat if you want to upgrade the upholstery in your current boat, Kris' Custom Sewing can make the interior of your boat shine! With special padding for cushion, the finest vinyl materials and a perfect color match, you boat will stand out with custom boat upholstery! Upgrade your boat or camper with a custom living enclosure! From a simple awning or bimini to a complete living area, Kris can design and build you the perfect enclosure to enhance your boating or camping excursions! Awnings add character and safety to any commercial building. Whether you need a new awning to enhance the look of your building or your existing awning is in need of repair, call Kris' Custom Sewing. Let Kris help you add that finishing touch to your building! Don't let the afternoon sun prevent you from enjoying your patio or porch! 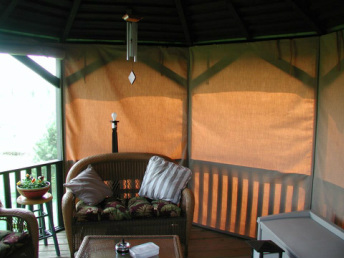 Custom porch curtains or awnings will not only improve the look of your home or business, it will also protect you and your guests from the sun. Let Kris' Custom Sewing design and make your Awnings and Curtains! If you can dream it, Kris can sew it! Have an idea for a custom cover or fabric structure? If you have an idea, Kris can make it reality! Kris has made everything from costumes to custom camera covers for news studios; custom upholstery to padded instrument cases. No idea is too big or too small! Bring your idea to Kris' Custom Sewing and let them make it a reality!